Mangaluru, June 16, 2016, DHNS: Passengers head to the terminal after being evacuated fromthe Jet Airways flight9W-2839 that made an emergency landing at the Kempegowda International Airport in Bengaluru on Wednesday. Smoke had engulfed the Mangaluru-bound aircraft’s cabin, triggering panic among passengers. 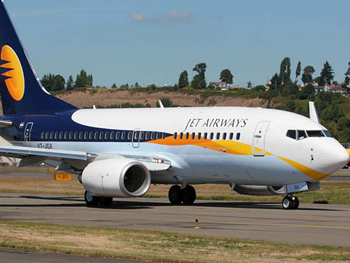 “Less than 10 minutes after the Jet Airways flight 9W 2839 from Bengaluru to Mangaluru took off from the Kempegowda International Airport, the aircraft was filled with smoke,” recalled Mukesh Kumar Jain, a business development manager at Novo Nordisk India Pvt Ltd, a pharma company in Bengaluru. Soon after landing at Mangaluru airport, Jain told Deccan Herald he was on a business trip to Mangaluru when the aircraft developed a technical snag mid-air. “When I peeped outside the window, the engine too had stopped. However, the pilot and crew were extremely good and they safely made an emergency landing back at the Bengaluru airport,” Jain said and added that he was the first one to jump off the aircraft as soon as it stopped. “Two to three of us helped many passengers jump out of the aircraft before the ladder arrived,” he said. Meanwhile, 64-year-old Haresh Soali, who deals with engineering tools and represents Oriental Tool Company in Bengaluru said that initially he presumed that the crew had sprayed some perfume or the cooling system was emitting smoke. “But soon, I realised that it was something else and serious. Within seconds, the situation turned scary, but we were lucky nothing untoward happened and we landed safely,” he said and added that he saw ambulances and fire tenders waiting near the aircraft. Parag, who was going to Mangaluru with his parents from Delhi for his admission at Manipal University, said they were scared for a few minutes when smoke engulfed the aircraft and when one of the two engines stopped, but they were relieved as the aircraft landed safely. Interestingly, many passengers refused to speak when they realised this correspondent was from the media. One elderly woman said: “I did not see anything.” Another middle-aged woman accompanying her too added that both of them did not see anything! Mangaluru International Airport director J T Radhakrishna told Deccan Herald that there was only smoke and no fire. As 9W 2839 returned to Bengaluru and made an emergency landing, all the passengers were accommodated on the next flight and the flight landed at Mangaluru airport at 2.28 pm.